To some authors, promoting their books can be tedious and demoralizing, but last week I was pleased to take part in two types of book promotion I enjoy, and they were at the same event. Three panelists and our moderator gathered in a small upstairs room at the Ella McClatchy Library in downtown Sacramento to chat with a room full of book enthusiasts. The audience asked lots of questions and then stuck around until closing time to talk with us about all things book related, which happened to be the panelists’ favorite subject as well. Prior to the event, our moderator sent us some of the topics we’d be talking about. Several of the questions had a slightly different spin than I’d answered before and I thought you might be interested. What led you to choose murder as your subject? The simple answer is that when you’re writing about murder, you’re writing about the ultimate “high stakes.” For my mystery short stories, I explore what combination of events could turn an ordinary person into a murderer. With my series, the murder is more of a jumping off point. My driving force has been to explore a social issue through that medium, and my characters’ journeys are as important as the plot. How do you research your kind of murder? The murder has to have its own personality and a specific reason for that particular type of murder weapon. 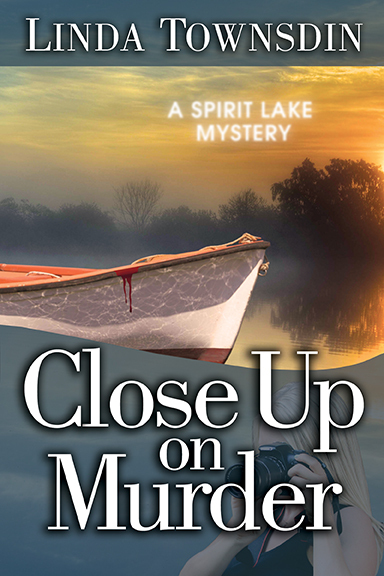 While researching a historical component in Close Up on Murder, the second in my Spirit Lake series—set in contemporary times—I devised a symbolic murder and not one you’ll often read. In my third, Blow Up on Murder, the weapon is specific to a type of technology and I had a lot of fun researching that. My go-to research tools are Google, Google images, I talk to experts, visit libraries, watch videos and related movies, read magazine articles, etc. Whatever I need to do for the story to be believable. Only a small percentage of what I’ve learned gets into the story, just enough to make the situation seem real and as accurate as I can make it. The murders in my short stories—I have one in the 2017 Capitol Crimes Anthology and one in the 2013—are diabolical and devious. In both cases, the stories took an unexpected turn based on what popped up through research. What influenced you as you created your characters? In my Spirit Lake series, I created a woman in a tough field. She’s a photojournalist with insatiable curiosity and a strong sense of right and wrong, who covers war and disasters worldwide. I wanted to explore how she is perceived in her working world, where her assertiveness and drive are applauded, and contrast that with how she’s viewed in the small town of Spirit Lake, by her brother, the man she loves and old friends, who think she’s reckless and foolish. And also how she deals with wanting to go on the dangerous assignments to show the world how it impacts the most vulnerable: women, children and the elderly, while feeling torn about leaving her loved ones and her guilt for worrying them. The setting of my series is a small town in Northern Minnesota near an Indian reservation. Native American culture plays an important role in the area and I wanted to pay homage by creating several recurring Ojibwe characters. Some characters only appear in one book and a random magazine photo will spark a character. That happened in my latest, Blow Up on Murder, and that added an unexpected dimension to the story. My short stories usually start with asking myself what would cause an ordinary-seeming person to act completely out of character. In The Good Gardener, my story in the Capitol Crimes 2017 anthology, I wondered how far a middle-aged woman who was a loving wife, doting mother, avid gardener and steadfast employee would go to hang on to what she thought she deserved. It was an interesting set up for me as an author to explore. Do you get depressed writing about death? My mysteries begin when a social ill haunts me. It angers rather than depresses me, and by writing about it, I work through some of those feelings. Although I write my series from my protagonist’s point of view, I also delve into what the other characters are experiencing. The bad guys in my books always believe their actions are justified so I have to imagine what that perspective would be like. Do you describe police procedures? If not, what kind of investigation does your character do? My main character is a photojournalist, and in two of the books, she’s first to discover the murder. She knows better than to tamper with a scene, but takes photographs before the authorities arrive. As a writer, I have to know enough about police procedures, the FBI, Minnesota Bureau of Criminal Apprehension and tribal police, and how those entities interact, to be able to accurately write about it. However, everything is seen through Britt’s eyes, and she’s not an expert on detailed forensic techniques. What was the hardest thing you encountered when writing? I love every aspect of writing a mystery or short story. I devour how-to advice on craft and am grateful for all those authors who share what they’ve learned. The initial excitement of a budding idea gives me enough steam to begin what will be at least a year-long project. Even though the middle can be daunting, I’ve found that if you get that right, it enriches the entire story. It might even be the most important. And yes, I even enjoy the rewriting and final editing. Inspiration can happen anywhere if your head is in the right place. When I go for walks with my dog, she’s aware of every smell, sound and movement around her. I’ve tried mimicking her. When she stops to sniff something on the ground, I put my own nose into a bush or tree at my level even though my sense of smell isn’t the greatest. If my dog hears something that excites her, I try to listen hard with that same head-raised alertness. It’s great practice for being in the moment, that place where ideas have room to bloom. Books inspire me, and online articles or newspapers and magazines. I especially like Wired for the technology information. I watch television. Lately Outlaw Tech is my favorite. When a subject catches my imagination I go for it. Then the research leads to more research, and as I write, characters show up as needed. I hope you’ve enjoyed reading about my creative process. I’m curious to hear how you might respond to some of these questions, or questions you’d like me to answer. Let’s hear it! 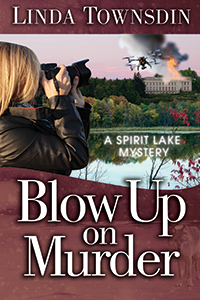 The third of my Spirit Lake Mystery series, Blow Up on Murder was published in February! As always, it was hard for me to let go, but it was time to move on. In March, I attended the Left Coas t Crime Conference in Honolulu, and was thrilled to be on a panel with authors whose series also showcased strong female protagonists. To prepare, I read one of each of their books, and am so glad I did. I now have three new authors whose books I enjoy, and made new friends as well. Check them out: Nancy Silverman, DV Berkom and Corey Fayman. Our wonderful moderator, photographer Robin Templeton, read my latest book and said I got the photographer mindset right—a great compliment coming from her. One of the best reasons to attend writers’ conferences is to learn about authors. I’d never read Colin Cotterill, who lives in Southeast Asia and writes the Dr. Siri mystery series. I liked Cotterill’s wry humor and wonderful characters and now have another series to read. After the conference, it was time for R & R and a visit with my daughter and son-in-law, who live on Oahu. My new favorite treat is a visit to Banan, where they use locally grown bananas and other fruits and ingredients to make delicious soft serve desserts. And in the spirit of filling the well, we hardly missed a sunrise or sunset at the beach. I’ve been reading a lot and recently finished Suspect by Robert Crais. I read it twice back to back. The second time because I wanted to know why that story stayed with me when so many others have not. I’ve figured it out, but you’ll have to read it to find out if it has the same effect on you. I’ve also been binge-watching the Danish TV crime series Dicte. A friend suggested it because the protagonist is a female journalist with similar character traits as Britt. They both have big hearts and a knack for getting themselves into dangerous situations in their quests for the truth. Another similarity is that what makes them excellent at their jobs creates havoc in their relationships with loved ones. Most recently, my local chapter of Sisters in Crime hosted a writing workshop. I attended a session by a DNA expert and another with business tips for author-publishers. What’s next? I’m looking forward to speaking to a book club in my community, one of my favorite things to do. I love books, book clubs and meeting new readers. The next book in the Spirit Lake Series is percolating. In the meantime, I hope you’ll read Blow Up on Murder and let me know what you think about Britt’s latest challenge. This post is worth sharing from one of my favorite blogs, Writer Unboxed. I hope you’ll read it. It prompted me to repost it and add my own thoughts, specifically about female protagonists in mystery series. The majority of readers have let me know they thoroughly enjoy seeing the world through the eyes of my series protagonist, Britt Johansson, but she does take occasional heat from other characters in my stories because her actions can often seem reckless for a woman. That gives me, the writer, an opportunity to set the record straight. The way I look at it, Britt’s actions could be seen as reckless if taken by an average person, man or woman, but not for Britt’s profession as a photojournalist covering international conflicts and environmental disasters. Taking risks is a pre-requisite in her line of work. Another issue I’ve heard discussed about female protagonists, particularly in the thriller and mystery genres, is that they aren’t likeable enough, or too focused on their jobs—criticisms rarely extended to male protagonists. In Britt’s case, her mission is to help make the world aware of the plight of women and children who are victims of war. That sometimes takes a toll on her personal relationships, and she’s not the type to compromise much. Men behave that way all the time, and it’s acceptable, but when women put their careers or dreams first they’re often held to a different standard. Books written by women with female protagonists have come a long way, but as Jo Eberhardt’s post points out, there continue to be lots of misconceptions and stereotypes. What’s satisfying to me as an author is that I get to work these things out any way I choose and so far, readers seem to like it. I’d like to hear your thoughts on female protagonists in the mystery genre. What are your expectations as readers? 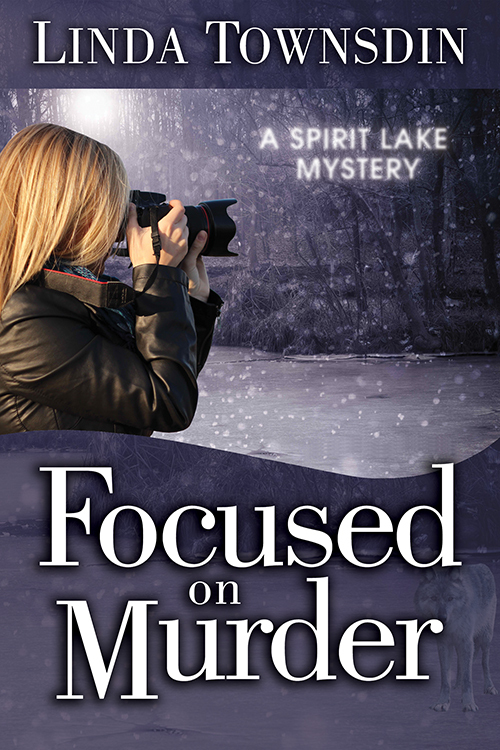 You might or might not have wondered why you haven’t seen my blog lately, but I’ve been working on the next book in my Spirit Lake Mystery series. I’m not much of a multitasker, especially during this first draft phase. Authors use the terms plotter or pantser. It means the writer follows an outline or writes by the seat of their pants without planning. Most of us are both of course. But what all novels and all projects involve is delving into the unknown. Creating with no net. Most likely, it’s not much different than what anyone experiences at the beginning of a big project, writer or not. Lots of uncertainty. And it takes concentration. Writers like to use metaphors to describe what it’s like to write a novel. This morning, sitting at my computer in my brown ankle-length bathrobe and furry boot slippers, I feel like a sluggish bear coming out of a deep sleep. My brain-fog has cleared, I’ve stretched my hunched-over body and the knot between my brows has eased. It’s not spring, it’s winter, but unlike bears, writers don’t use seasons as a timeline. For me, it’s about believing I have a good story to tell now that the first wild excitement of exploring an idea settles into completing that first draft. Yesterday I was so close to reaching that goal nothing could penetrate my focus. Someone asked me a question and then wondered why it took me so long to respond. It’s not an easy transition from my story world to my real life. That same evening my son, who was over for dinner, looked in the pan on the stove and then at me, eyebrows raised. “What is that?” I wasn’t sure. But this morning I am alert, alive and excited, because the next part is where the real fun begins. Making the scenes and characters come alive, honing the plot and action to keep you, the reader, surprised and engaged and enjoying the story. But first, I’m about to go for a stroll through the woods, sniff the air, nibble blueberries or swat at a fish upstream. Wishing you all happy holidays and happy reading!